We enjoyed attending this years ParkEx 2019 conference at the NEC in Birmingham this week making lots of new connections discussing our work in ridding communities of Persistent Evaders and Nuisance Motorists. With a personalised opening address via video from Rishi Sunak, MP for Local Government, experts, specialists and industry leaders contributed to the best attended Hub sessions that the event has ever held. The DVLA, TEC and DfT all took to the stage to add their voices to sessions that covered the use of data, clean air zones, changing public perceptions and the latest on the Parking (Code of Practice) Act 2019. 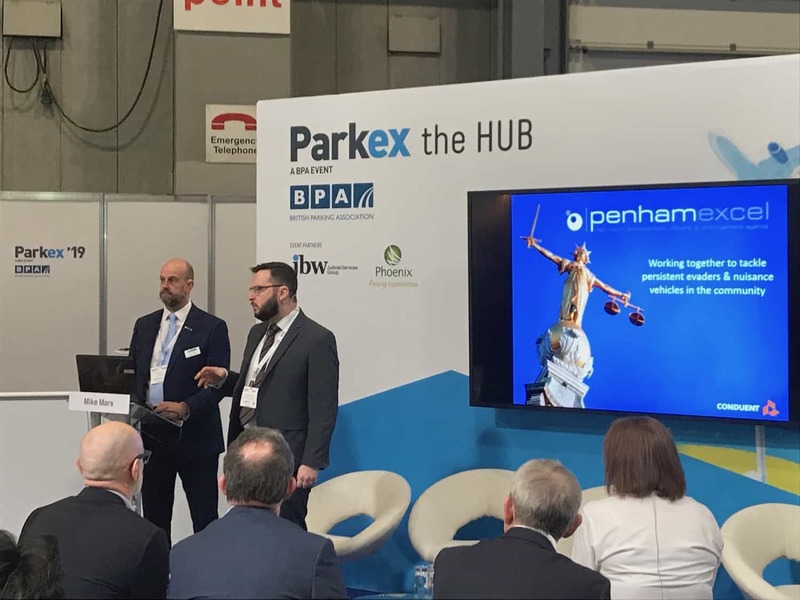 Philip Hammonds and Alan Wood represented Penham Excel and divided their time between the Conduent and BPA stands as well as attending some of the hubs and presentations. We were also one of 10 finalists for the Innovation Trail for our research and work tackling this issue with our partners Conduent and British Parking. Pictured above is Alan Wood (Penham Excel) and Dean Fennell-Connell (Conduent) presenting our work. We look forward to next years event to be held at the Ricoh Arena in Coventry.